Houston Texans-Seattle Seahawks Preview: Season Defining Moment For Deshaun Watson? The Houston Texans and Seattle Seahawks will enter Sunday’s game in remarkably similar circumstances. Both entered the season with high expectations including another division title and playoff run. But neither is considered the favorite in their division anymore. The AFC South title no longer goes through Houston. Instea, it goes through Jacksonville (for now). The Jaguars have been the surprise of the season, so far, starting with the dominant win in the season opener over the Texans. But there have been chinks in their armor along the way. Blake Bortles still has to be managed properly That can only be done as long as they can run the ball. If Leonard Fournette’s ankle issues persist, that may be easier said than done. If Deshaun Watson continues to improve, Houston’s Week 15 game in Jacksonville could be for the division title. Seattle has had some of the same issues that plagued them last season. The offensive line is not very good which means Russell Wilson is not getting the protection he needs and running lanes are not opening up. Of course, it might help if they had a good running back. But they just have a collection of okay ones. While the defense is not quite the powerhouse it has been in recent years, it is still one of the better units in the league. Losing Cliff Avril will hurt, but it will be interesting to see what Dwight Freeney still has in the tank (if he plays after signing earlier in the week). 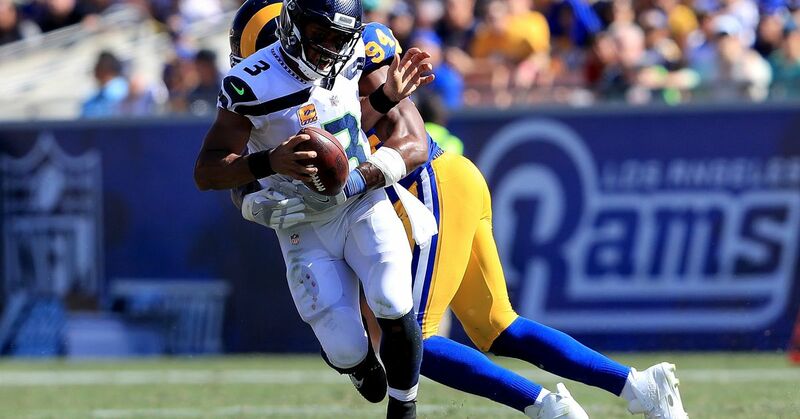 After beating the Los Angeles Rams a couple of weeks ago, the Seahawks are in the driver’s seat of the NFC West. But to remain, they have to keep winning. With how they’ve played so far this season, it is hard to have confidence in them. So, in the Seahawks and Texans we have two good but flawed teams. Both are capable of putting up of points. Both are also capable of playing great defense. When they meet Sunday in Seattle—who’s going to win? The game will be decided by whoever can overcome the other’s defense. Seattle’s defense isn’t as strong this year, but it is still the fourth best in regard to total yards. But Houston’s only gives up six more yards than the Seahawks (310.5 yards/game to 304.5 yards/game). However, the Texans are also letting teams score a lot more (24.5 points/game compared to 15.7 points/game for Seattle). Either defense could easily dominate the game. But someone has to win. The easy answer would be to give the advantage to Russell Wilson over Deshaun Watson because of his experience. Wilson probably will make some plays that Watson doesn’t just because he is more familiar with the NFL game. But his downfall will be his offensive line and running backs. Seattle will not have a running game. Whether it is Eddie Lacy, Thomas Rawls, or the water boy—it will not matter. The Seattle offensive line will not be able to keep any running lanes open against the Texans defense. This will force Russell Wilson to throw much more than the Seahawks want him to. The Texans may be down J.J. Watt and Whitney Mercilus, but they still have a pretty good pass rush. Wilson will make some plays and get off some incredible throws. But his poor offensive line will not be able to hold Houston’s defense back. The Seahawks pass defense is no joke either, and they can rush the passer as well. With the speed they have at linebacker, it is not hard to imagine them closing on Watson when he starts to scramble and holding him to short gains. 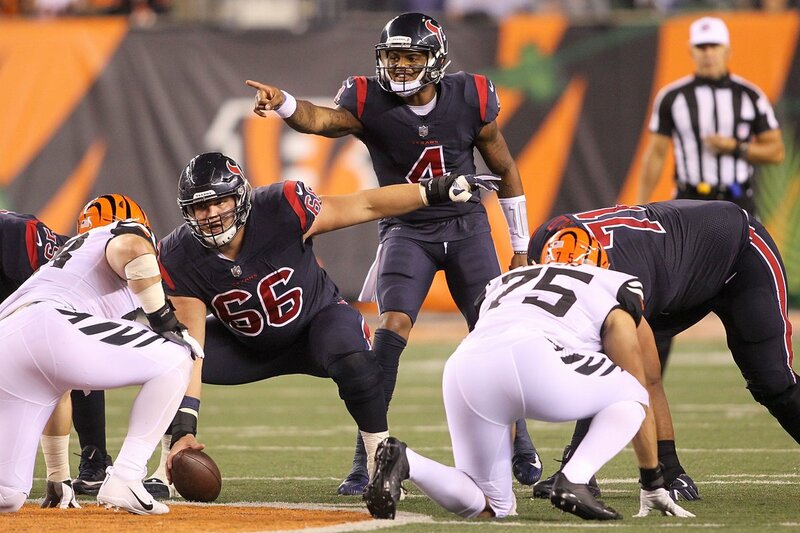 Logic would dictate picking the Seahawks here, but there is something about Seattle’s offensive line and Deshaun Watson that make it hard to do that. This game will be decided by less than a field goal. Take Houston and the 5.5 points.